Sorry may seem like the hardest word, but expressing gratitude – and the right amount of it – often can be tricky too. Whilst it’s safe to say that most volunteers like being thanked for their efforts, effusive praise can appear insincere, losing its impact, and restrained praise can leave someone feeling like they’re being taken for granted. With over twenty years of experience in this sector, I have personally witnessed the fallout from situations where recognition wasn’t managed well and the tremendous impact it had on individual volunteers and the wider organisation when it was. Inevitably, there may be occasions when trying to keep everyone happy will prove impossible. I vividly recall an example of this from my own personal experience when organising a Volunteers’ Week trip on a double decker bus for about forty volunteers. Half of the group wanted to do to the Royal Horticultural Gardens in Wisley, whilst the other half wanted a day by the seaside in Margate. My attempted compromise of Hever Castle pleased precisely no-one! In that situation, correctly gauging feelings proved difficult, but it’s important to recognise that this issue pops up routinely in day-to-day interactions with volunteers. Some volunteers enjoy frequent pats on the back and others assiduously shun the spotlight. Some like having their birthday acknowledged whereas others are genuinely embarrassed and would rather keep it quiet. As each volunteer is an individual, I’ve simply found that asking volunteers about their preferences is a great place to start. While there is nothing wrong with long service and other awards, I tend to advocate volunteer recognition scheme’s that acknowledge everyone’s contribution. My experience has led me to the conclusion that it can be unwise to elevate one contribution above another and that more equitable recognition can be achieved by acknowledging that what on the face of it might appear to be quite a small contribution may actually be the result of someone overcoming several barriers and making huge personal sacrifices. As volunteer coordinators, I don’t think we need to pre-occupy ourselves with asking if one volunteer’s contribution is somehow worthier than another’s. Perhaps more important is in recognising and rewarding the value of volunteering, we are also celebrating diversity and remembering that each volunteer is unique and that each contribution is of value. That is precisely why I look forward to national Volunteers’ Week – it aims to recognise the contribution of all volunteers everywhere. Each year in the first week of June, organisations working with volunteers and support organisations like Volunteer Centre East Sussex get the chance to say a massive ‘THANK YOU!’ to all their volunteers and, funds permitting, throw a party or hand out a few certificates. Events during the week are also an opportunity to highlight the value of volunteering and, hopefully, attract some new volunteers. Although there are other initiatives throughout the year aimed at celebrating volunteering and there is no need to confine activities to 1-7 June each year, there is something special about Volunteers’ Week. There’s nothing quite like trying to gather 150 people together, each clutching a red balloon, to form a large V-shape for an aerial photo in the pouring rain (the week is held in high summer after all!). Nor are there many better feelings than watching someone who you remember telling you they had no skills to offer during their informal interview proudly posing for pictures with their certificate of volunteering achievement. It is easy to overlook how awarding a certificate can truly matter to someone. Recently, I met a man who I helped to recruit as a volunteer youth worker some twenty years ago. He told me he still has his first Volunteers’ Week certificate on the back of this bathroom door so he can lie and look at it whenever he’s in the tub! 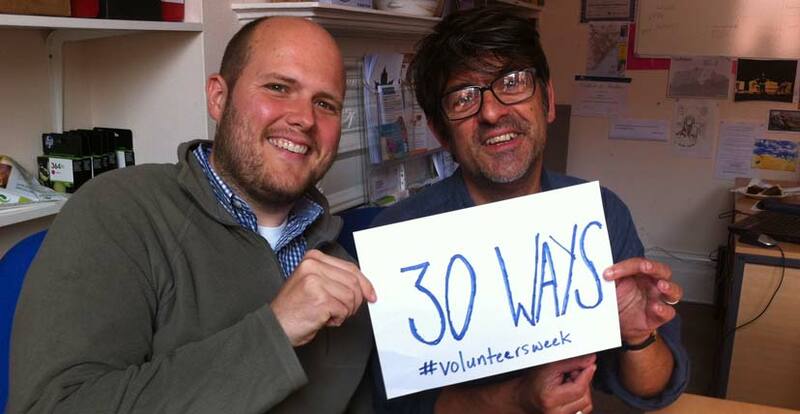 This year Volunteers’ Week hits 30! If your organisation is planning an event and would like us to publicise it, please send details to info@vces.org.uk. You can also tweet us @VolCenES and we’ll retweet during the week. We wish you a very Happy Volunteers’ Week 2014!